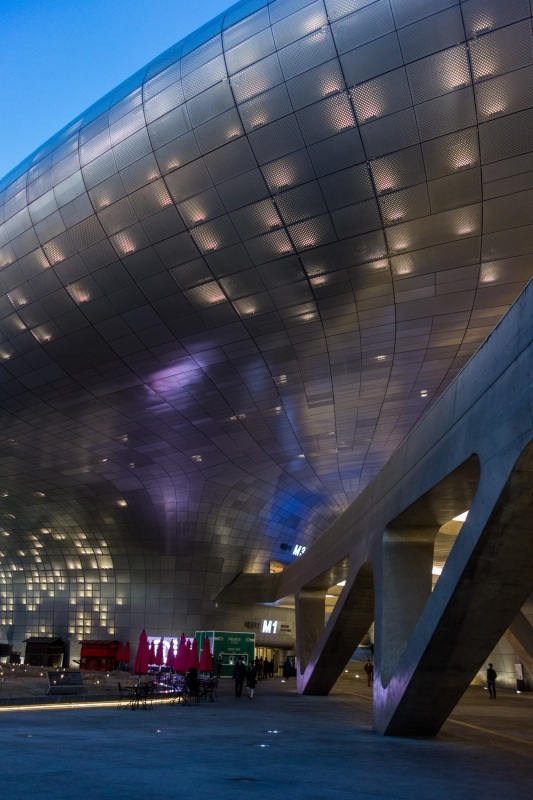 The Dongdaemun Design Plaza is a fantastic building, a true achievement in design and construction and a must-visit in Seoul. 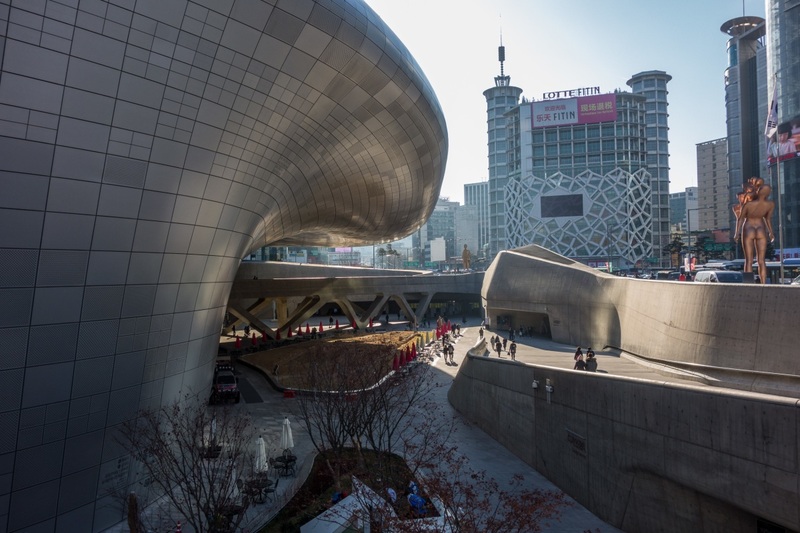 The Dongdaemun Design Plaza (DDP) is one of the most important recent public buildings in South Korea. It offers a range of exhibition spaces, seminar rooms, event halls, library, education center, serving as a hub for design-related shows and conferences, exhibitions, and other events and gatherings. 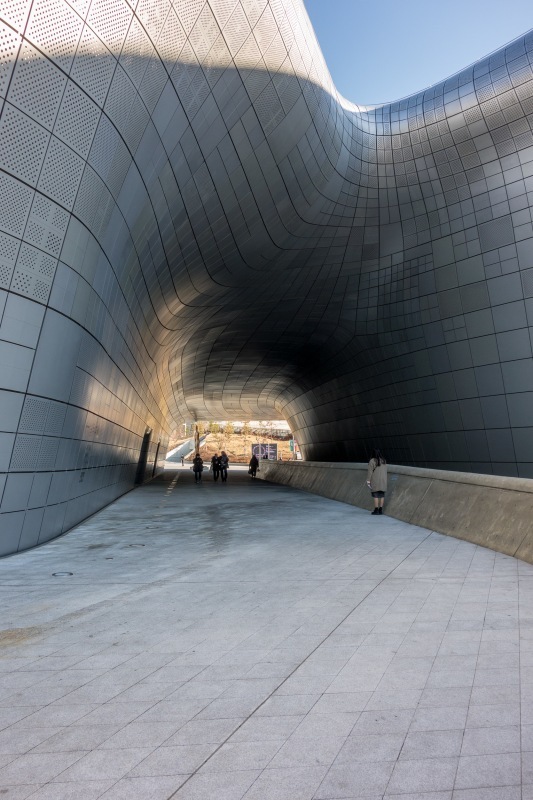 When I visited the site back in 2009, it was still a huge hole in the ground surrounding the first phase of the compound, the tiny Dongdaemun History and Culture Park. I left with a bad impression; it just didn't make much sense that small museum with those weird, poorly done concrete walls and funny shapes. I failed to understand the scale of this thing and quickly dismissed it as "just another Zaha." Seven years later I realize how wrong I was. 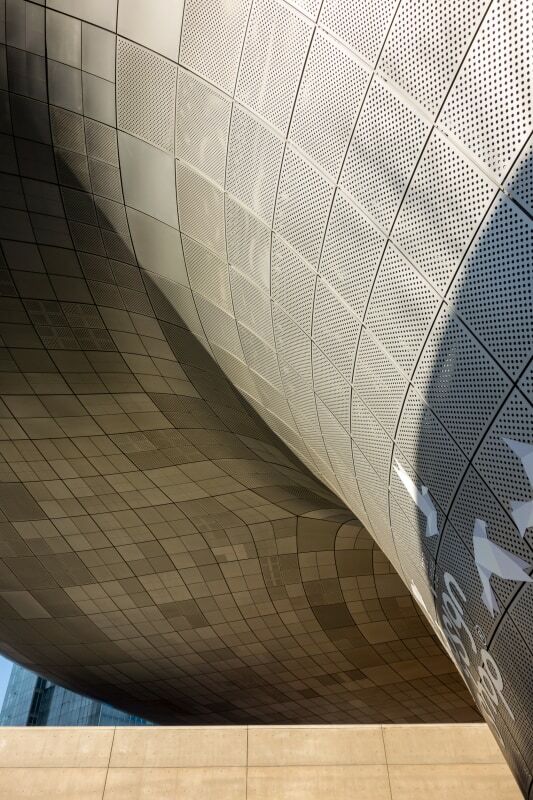 It is a fantastic building, a true achievement in spatial design and construction techniques. It is also a weird-looking building but in a good way. Riding along Eulji-ro avenue you quickly spot it's big mass, smooth and oval, standing in the corner, like a giant stranded whale. Getting closer, you realize how this massive body is cantilevering above a sunken plaza, at the same time building and roof. You can see the large bridge leading you into the building, but also a tunnel on the left side, leading you to somewhere else. There is a ramp, right next to another entrance. There is a semi-enclosed courtyard that takes you to the building roof. And that’s just a hint of it. You soon start to understand that this is a building that invites exploration, that there is not one entrance, but several, at different levels and in different shapes and forms. Do you want to get in through the basement? Just get out of the subway, and you can walk right in. Fancy a rooftop entrance to explore the building from top to bottom? Just walk over the roof garden, and you’ll find it. The public space surrounding it was all interconnected and offered a diversity of possibilities rarely seen in public buildings. Once inside, I got a bit lost. Although impressive in its vastness and whiteness, I found it disorienting; it was not clear what was there to do in the place. The names of things were not self-explanatory (“Design Pathway”? ), and a few rooms were just empty, like the weird windowless space supposed to be a public cantine or the large atrium of one of the galleries. Other did not make much sense, such as the long winding spiral corridor that went too long with not much to see along the way, or another gallery which started on one floor and ended on another, with multiple people confused about where the entrance was. As an architect, I know it is hard to accomplish it all. What it misses on the internal organization, it makes up in the outdoor public spaces it creates. The fact that it is always open, accessible, already promotes so many opportunities for all that space to be used by the people. And despite being a huge mass of concrete and steel, it still manages to be friendly, with its fluffy, blobby shape and smooth facade, which at night lights up much more subtle and classy than one would expect. As I previously mentioned, the public areas of the DDP are open 24/7. You can just come and walk everywhere, which is, anyway, how you should spend most of the time there. 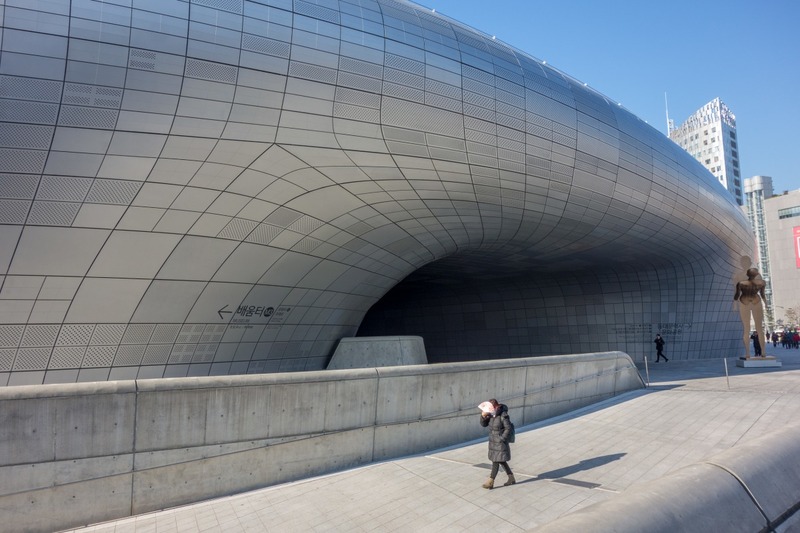 Inside, temporary exhibitions are displayed along a permanent collection of traditional Korean design. There is a design shop and cafes to spend some time relaxing. Check their official website for information on any special event going on during your visit, and try to participate!